Stetson’s Visioning Exercise for Bartram Gardens produced innovative eco-restoration landscape ideas. Officially, the event was called the Visioning Exercise for Bartram Gardens and Landscape Performance Monitoring. In reality, what occurred was more like laying seeds for both environmental sustainability and scientific exploration. On Oct. 27, students, faculty, staff and key community stakeholders got together, along with two of the top eco-restoration landscape architects in the Southeast, to discuss “what’s next” for environmentally sensitive and historically significant waterfront land adjacent to the rising Sandra Stetson Aquatic Center. 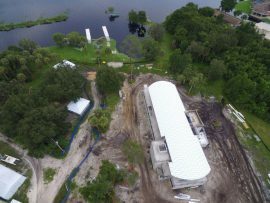 The 10,000-square-foot aquatic center, on the shores of at Lake Beresford in DeLand, not far from the university’s main campus, is scheduled to open in January 2019, with dual purpose as the home for Stetson’s Institute for Water and Environmental Resilience and Stetson’s men’s/women’s rowing teams. Part of the center, as outlined through funding provided by a Volusia County ECHO grant and the wishes of primary donor Sandra Stetson, also involves development and maintenance of innovative native landscaping. The visioning exercise was a day for preliminary groundwork in the form of an onsite participatory charrette to generate ideas that would help ensure a “really distinctive potential blend of an ecological garden with historical importance,” according to David Sacks of David Sacks Landscape Architecture LLC, one of the two experts invited to help lead the discussion. Then, the information will be utilized as the basis for developing landscape design and performance monitoring concepts that can be formalized into funding requests from appropriate agencies, foundations and donors. The Sandra Stetson Aquatic Center, shown here under construction in July, will open in January 2019. The second guest expert was Jon Calabria, Ph.D., associate professor of landscape architecture at the University of Georgia’s College of Environment and Design. Both were invited by Jason Evans, Ph.D., faculty director of the Institute for Water and Environmental Resilience and an associate professor of environmental science and studies at Stetson. In the past, Evans has worked with each of the experts. On this day, another prominent name was William Bartram. In 1774, Bartram, a naturalist, sailed up the St. Johns River to document the exotic Florida landscape, including areas near DeLand. Armed with a club, Bartram was known to have fought off alligators and wrote about the encounters in his 1791 book, “Travels,” which captivated Europe and America and remains a classic today. It’s probable, or at least possible, that Bartram spent time on Lake Beresford and perhaps on the aquatic center’s property. As a result, with Bartram in mind, historical integrity became a leading topic. Notably, Stetson already has embraced the legend of Bartram. In late 2016, Stetson Professor Tony Abbott, Ph.D., published a brochure, “Experience William Bartram’s Florida,” in partnership with the university, the River of Lakes Heritage Corridor, the Stetson water institute and the Florida Department of Transportation. Also, with the help of students he maintains a website, “Bartram Trail in Volusia County. Abbott, a professor of environmental science and studies, was active in the discussions. Now, Stetson wants to make its own version of Bartram’s Gardens. Next steps include Stetson senior Allison Terry, an Environmental Sustainability Fellow, working with Evans and Calabria to develop a concept diagram of all the collected participant input, allowing “us to visually summarize all of the thoughts that people shared during the facilitated discussion sections,” Evans said. For her part, Terry is learning as she goes. “It was very helpful for me to attend this event because it allowed me to see how a diverse group can come up big ideas for a project in a meaningful way through in-person discussions,” she said. Big plans are taking shape.